The publisher, Straw Hat Publications, gave me a copy of this novel in exchange for my review. Annabel is a charming 13-year-old. She is a cross between Pippi Longstocking and Shelia Tubman (Judy Blume). Annabel is in no way perfect and this set of five stories is a fun look into the life of a 13-year-old small-town girl. Annabel is invested with an energy and spirit that makes her simply good fun to read. In “Annabel and the Duckling,” Annabel stumbles into the role of parent for a duckling. To her friends she grumbles and complains, but the wealth of affection for the duckling is evident to readers of all ages. In this first story we’re told that Annabel’s parents have gained tolerance through experience and the reader, in that moment, has Annabel’s number. The tone of Davidson’s writing style is reminiscent of P.G. Wodehouse and Stella Gibbons. While there are positive themes in the novel, there are also negative. Annabel does lie, as children do. There’s no cursing or violence. 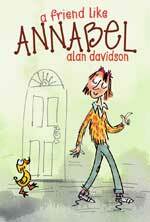 Annabel is an excellent entry into the quality fiction market for younger children. I read of few of the stories that I like best to 11-year-old Alex; and we discussed the themes. She loved the relationship between Alex and Kate, finding Kate to be a very loyal and good friend. One of the stories we read was “Annabel and the Duckling” and she found that story to be adorable and sweet. Alex thought that Davidson set the scene perfectly and she could picture the annoyance but affection of the adults and the connection between Annabel and her unexpected follower. I truly enjoyed this compilation of short stories. The stories are charming, nostalgic and perfectly set for children ages 8-180. Pick A FRIEND LIKE ANNABEL up today. Alan Davidson is from Scotland and worked as a a Civil Servant until he started writing in 1978. Many of his books have been re-released by Straw Hat Publications. Read a further review The Bewitching of Alison Allbright.